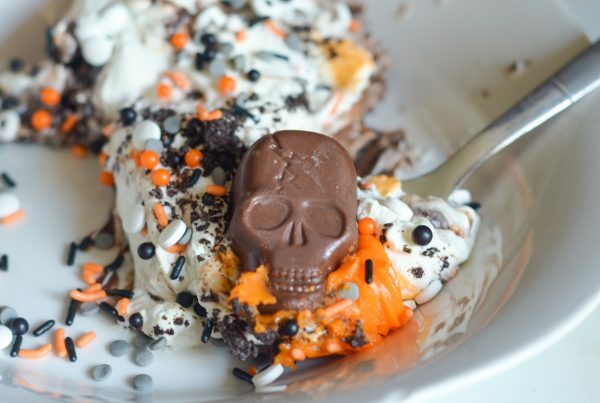 Get ready for a spooky Halloween with this Skeleton Graveyard No-Bake Pie! It’s nearly time to start planning all of those spooky Halloween parties. Do you plan a party? 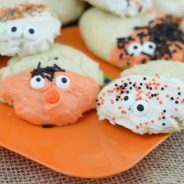 I absolutely love to make fun treats during Halloween season. How often do you get to make Skeleton Graveyards to eat and that seems totally normal? 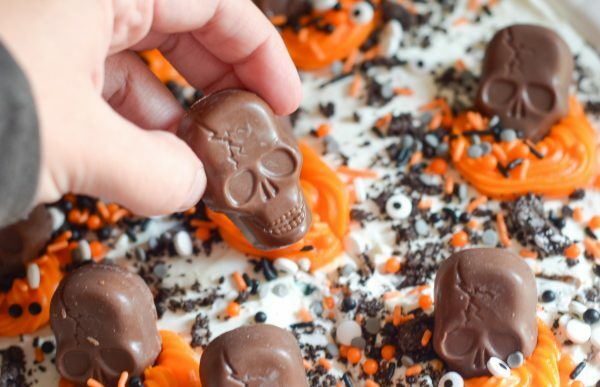 Just this month, so it’s the perfect time to do just that by making this Skeleton Graveyard No-Bake Pie. What is the key ingredient for Skeleton Graveyard No-Bake Pie? 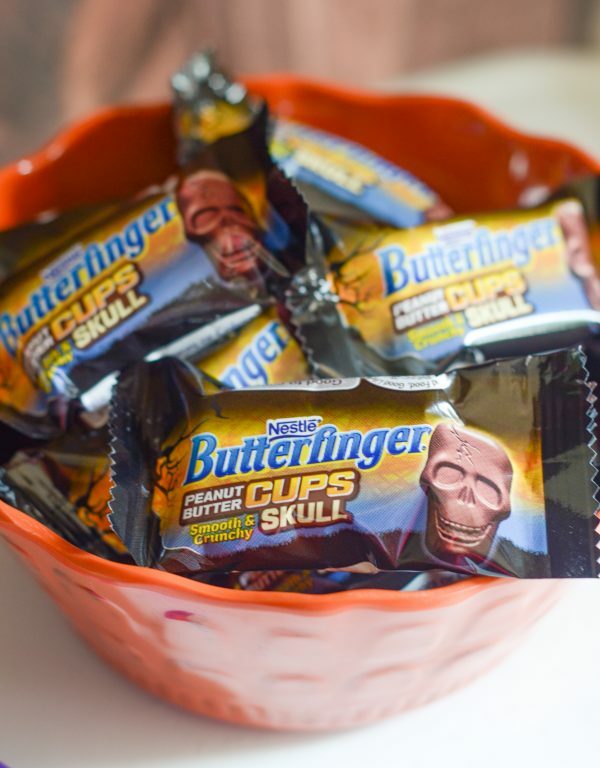 The must-have ingredient are the BUTTERFINGER® Peanut Butter Cup Skulls from Nestlé Halloween Candy. These are certainly necessary to be able to make this fun creation. Right now they are available at your local Walmart. Can I tell you that the Walmart Pickup saves my sanity? I just can’t even do full grocery shopping trips anymore, it’s just not the same as the pickup. 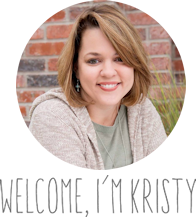 It’s amazing and makes it where I can easily order groceries after the kids go to bed, too! I also grab a few extra bags, too, because I’ll tell you, they are super tasty. 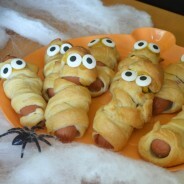 We purchased them last year as well and our trick or treaters loved them. 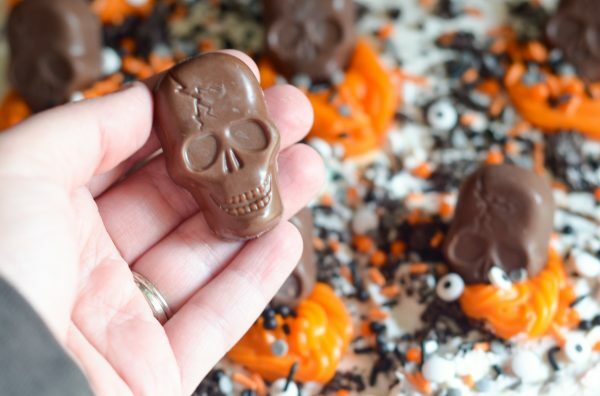 BUTTERFINGER® Peanut Butter Cup Skulls from Nestlé Halloween Candy make for a great BOLD statement for this Skeleton Graveyard No-Bake Pie. 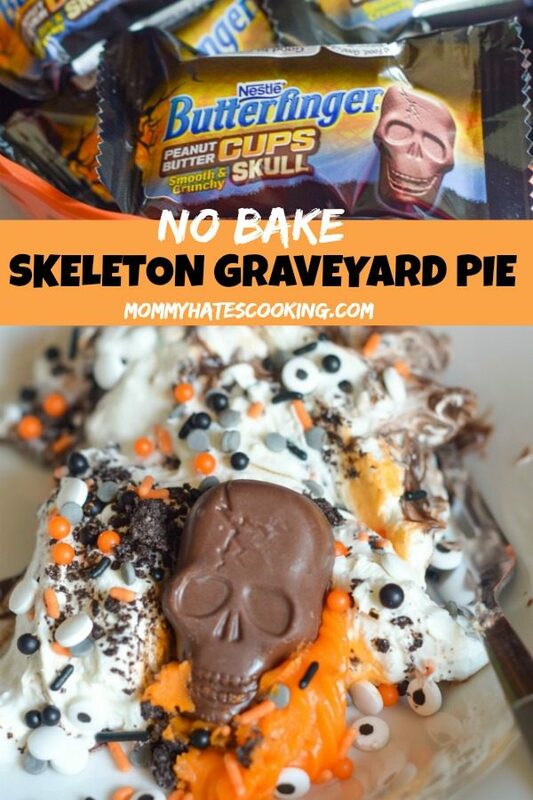 What do you need for Skeleton Graveyard No-Bake Pie? This can be made with a pre-made chocolate cookie pie shell or you can simply mix crushed cookies with butter and press it into the pie dish. This is the option I tend to lean toward. I also use gluten-free cookies to make this, too, but you can use your favorite chocolate cookies. 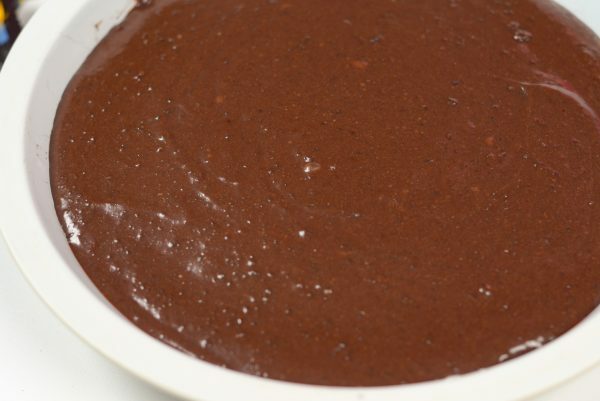 It’s best to use instant pudding to make this a no-bake option and quick to make. Remember, too, this is a pudding and cookie pie, so it isn’t going to cut perfectly like a traditional pie. If you do want that perfect cut, freeze the pie for a few hours before serving. 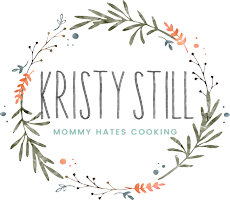 Time to Make Skeleton Graveyard No-Bake Pie! Are you ready for this pie? I have to say that my family LOVES it. They were so excited to see this, plus it’s a great one for the kids to get involved with. 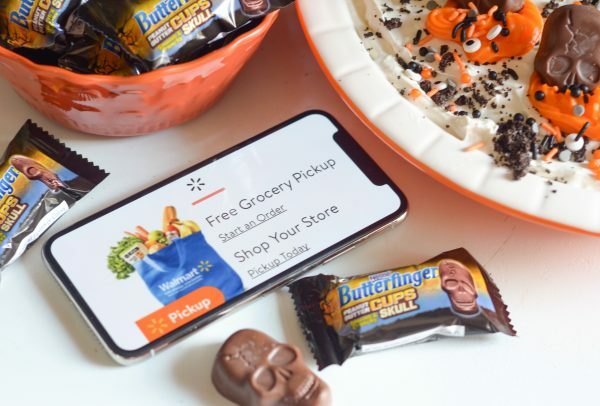 Remember to head on over to Walmart to pick up the BUTTERFINGER® Peanut Butter Cup Skulls from Halloween Candy to make this pie. 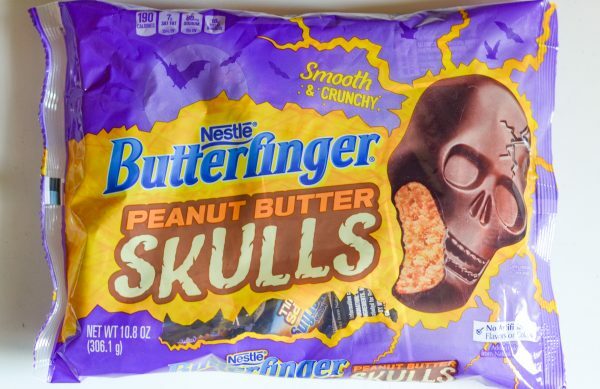 These will be easily spotted in the Halloween Candy aisle at Walmart, you won’t miss them! 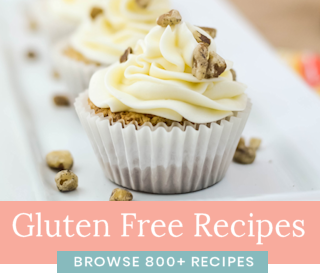 Plus, you will be able to find all your other ingredients there as well even if you are wanting gluten-free ingredients, those are easily available there, too. I also love to just add a little dish of them in our home for a little pick me up throughout the day. 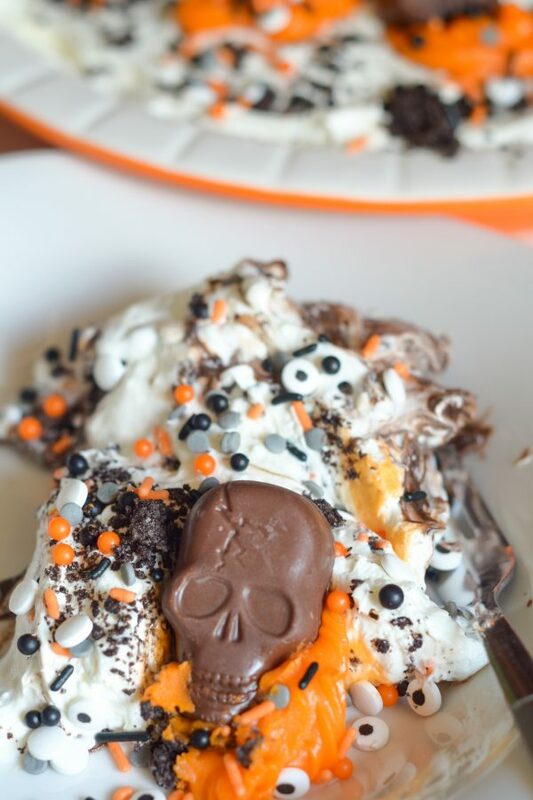 Now, as you plan out those fabulous, spook-filled Halloween parties, be sure to whip up this Skeleton Graveyard No-Bake Pie, the guest will love it! 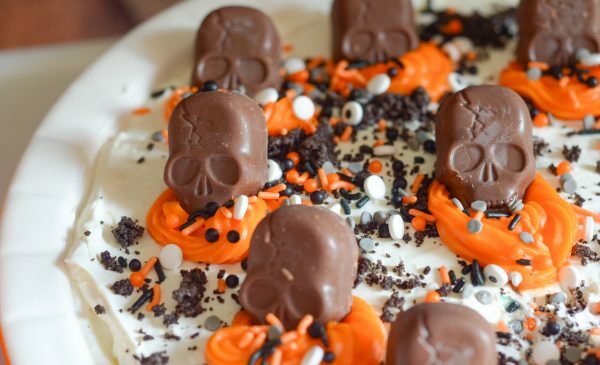 Make a great No-Bake Halloween Pie with this Skeleton Graveyard No-Bake Pie! 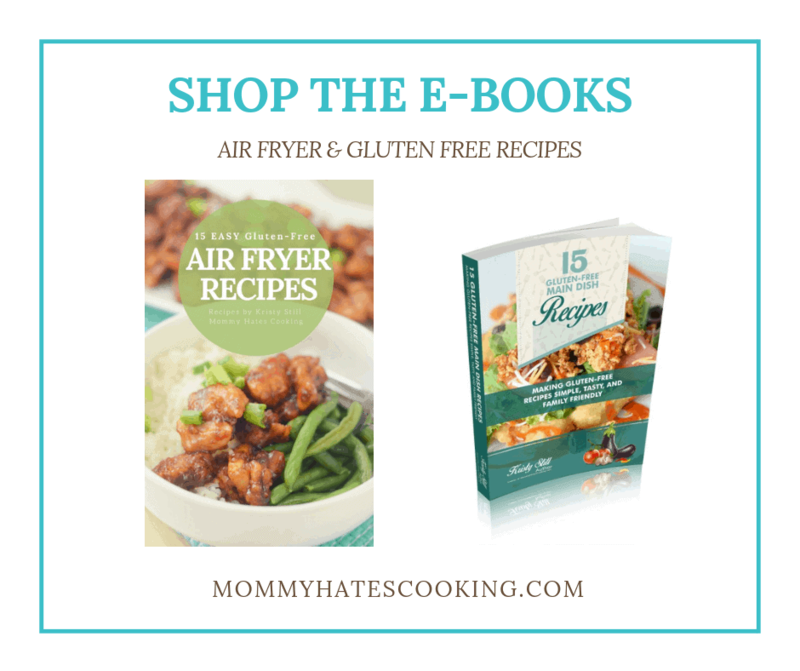 Plus it can be made gluten-free too! In a mixer, combine the pudding, cookies, and milk. Mix well until pudding is formed. Pour the mixture into a prepared pie shell and place in the fridge for 30 minutes to harden. While the pie is in the fridge, whip together the whipped topping, cream cheese, and sugar. Mix well until a nice frosting is formed. Remove the pie from the fridge and top evenly with the whipped topping. Place the pie in the fridge for 1 hour to fully harden before decorating. Remove the pie and sprinkle with remaining cookies. 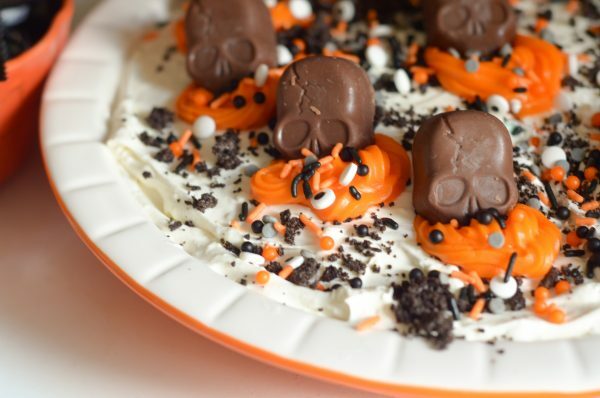 Add little circles of orange icing on the pie and place a BUTTERFINGER® Peanut Butter Cup Skulls in the orange icing to create the graveyard. Sprinkle with Halloween sprinkles if preferred. Chill for 30 minutes to an hour and serve. If you prefer to make your own pie shell, combine 2 cups of crushed chocolate cookies with 6 TBSP of butter. Once combined, press into the pie pan. Let this harden in the fridge for about 30 minutes before beginning the remaining steps. This recipe takes about 2 packages of chocolate cookies to complete. 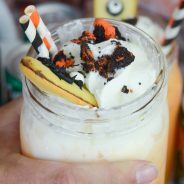 Yum this sounds so yummy! Pinned! Thank you for sharing on Merry Monday! Hope to see ya next week!